Climate and air are important factors in the weighing process for spatial planning and a permanent element of urban land use planning, environmental impact assessments and location analyses. What is still missing for an appropriate consideration of these aspects, however, also in view of competing planning targets, is area-related information. 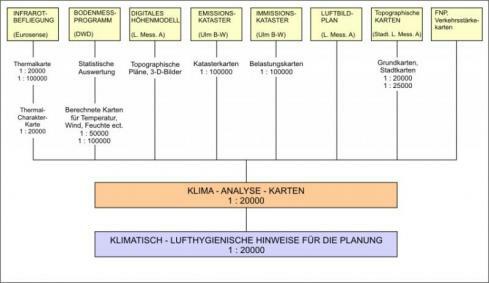 Following an initiative by the city of Sindelfingen, the administrative board of the neighbourhood association Stuttgart seized the idea of a climate analysis within its territory in 1987 and charged its office with examining the organisational and financial requirements. The administrative board of the neighbourhood association Stuttgart decided on the realization of a climate analysis on 8 April 1987 and this on the basis of a concept elaborated by the Department of Climatology within the Chemical Investigations Office of the city of Stuttgart (now the Department of Urban Climatology within the Office for Environmental Protection). At the same time, the neighbourhood association placed an order for the realization of infrared thermography, which is the first step provided for in the concept. Thermal maps of the area under investigation were produced by EUROSENSE GmbH (Ltd.) in Aachen on the basis of two infrared measurements carried out by an aircraft on 18 and 19 August 1988. The use of a digital scanner in the aircraft and a digitized preparation of the data and images allowed for analyses that went beyond the representation of surface temperatures. The administrative board decided on 23 September 1987 that the Department of Climatology within the Chemical Investigations Office of the city of Stuttgart (now within the Office for Environmental Protection) was responsible for the technical processing of the climate analysis. An accompanying task force on "Climate" was established within the neighbourhood association Stuttgart at the same time whose job was to coordinate the extent, form and contents of the planned climatic atlas. The purpose of the analysis is to work out the basic materials required for a proper consideration of all climatic and air-related aspects and to prepare the information for the planning process within the association and its participating towns and municipalities. The scale of the analysis is geared to the needs of land use planning, which is a combined task of the neighbourhood association and associated municipalities. The problems of land use planning, especially the question of how to allocate built-up and unbuilt areas, correspond to the scale of local climatic features and can therefore be expected to be solved. A consequence of this, however, is the impossibility of gathering exact information on particular sectors from local climate maps. The mapped circumstances require a supplementary analysis, or at least an appropriate interpretation, in the context of the local development plan and even more so on the level of the individual project. Infrared thermography and with this the consideration of thermal relations justifiably occupy a central role within this climate analysis as the area under investigation is characterized by a marked topographic structure and frequent inversion weather conditions and therefore by a high frequency of cold-air flows near the ground. But the deliberations on climate-friendly planning must not be restricted to the aspect of ground-level cold air flows. In order to get an analysis of all climatic characteristics relevant for the planning, it is necessary to consider further parameters as well as the average conditions of a representative period of time in combination with the general climate statistics. Orders were placed in this context with the German Meteorological Service and both the Central Office in Offenbach and the Weather Central in Stuttgart were involved. The German Meteorological Service conducted a meteorological ground measurement programme between 1 May 1988 and 30 April 1989. The data from 12 stationary measuring stations in combination with an analysis programme developed by the German Meteorological Service form the basis of the mapping of important climatic parameters. Other measures are the calculation of a local cold-air discharge model including the representation of areas that are important for the local climate as well as the realization of further aerological ascents (balloon soundings) during the infrared measurement flights. The German vehicle inspections company DEKRA e.V. has analysed the layering stability of the near-ground atmosphere with the help of aerological soundings during particular weather conditions. The land surveying office provided a digital surface model, which is the basis of various computerized mapping systems. Stuttgart's City Surveyor's office has largely contributed to the publication of the analyses in the form of a climatic atlas thanks to its mapping materials and the graphic data processing. The printing of the climatic atlas was also carried out by the City Surveyor's office. The technical articles of the involved offices and the results they achieved are presented in figure 1.1. This figure also illustrates the methods applied for the analyses.